For this lawyer-politician, gossip is not just social currency or amusement, it is a genuine passion. Journalists lucky enough to be invited into his inner circle say that his public persona is quite unlike his private one: once he is sure he is among friends, he entertains them with his rich fund of stories about the private lives of everyone, including journalists and editors. He works hard at garnering his tidbits of information, whether it is in his "debriefing" sessions at the party office, in private dinner parties—unsurprisingly, he is on the top of every upwardly aspiring host’s guest list—and even while walking in Lodhi Gardens. His intimates joke that "he works while he walks". For well over half-a-century, his old-fashioned apartment in Sujan Singh Park has been the most sought-after address by prime ministers, presidents, governors, ministers and politicians of all ilk. At one point or the other, each of them has arrived, either singly or in carefully-chosen clusters, had their two rounds of Scotch and soda, enjoyed an hour of delicious gossip, bared their souls and departed, knowing that their secrets were safe under his roof. He writes about them, of course, and gossips about them as well, but without offending anyone. A self-professed gossip-monger, he says it’s his love of gossip that made him a storyteller. Despite his stiff public persona, journalists in the business of gathering gossip say he has a rich fund of stories which he shares generously. The good thing about him is that his gossip is rarely motivated—unless you get him started on his bete noire, Sharad Pawar. He has an eye for trivial details that is a gossip columnist’s delight, such as his friend Oscar Fernandes’ prowess with a mouth organ, and doesn’t think it’s beneath his dignity to share the scraps of information with journalists. The bad thing? He is mostly circulating the stories told to him by other journalists, contributing very little of his own. A taker, not a giver, according to some. His prime asset is that he’s a born storyteller. One of the most pursued dinner guests in town, he is witty, amusing and never short of stories to share. He is also very well-informed, which makes him a treasure for anyone hoping to host a power party. In fact, he is so popular on the cocktail party circuit that he rarely has to hold parties of his own. Better known as a networker than a gossip-monger, he is still regarded in the circuit as one of the best. In terms of information, that is. But few would seek him out for entertainment value. Most are ill at ease with the gossip he provides, aware that he might use it in his own interest. Others are squeamish about the style of his presentation. Back when she was still in the thick of things, her regular biriyani parties were the highlight of the gossip circuit. Politicians came, cutting across party lines, as well as journalists by the hordes. The real gossip sessions only started after most of the guests had finally left, leaving a cosy core group to drink, smoke and exchange gossip until the wee hours. To listen to her gossip in jugalbandi with Subramanian Swamy was an experience to treasure, both for her narrative skills and her pacing of the story. To add to her gifts, a good mimic. Has a reputation as a good information-gatherer. In fact, started his political career by collecting and carrying information to Rajiv Gandhi. 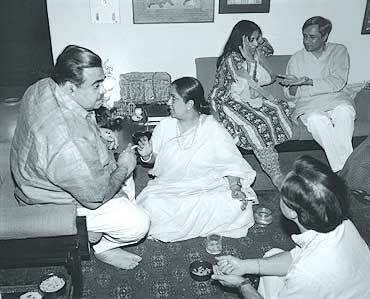 He owes his political career to gossip, according to some, giving him a foothold in the charmed circle around Rajiv. Not a former Doon School product like most of them. He can be a rich source of stories, but it’s usually on a one-to-one basis. Certainly not the life and soul of evening soirees, but can be trusted: he is neither vicious nor motivated, like many gossipers. The soirees held by her parents, Raj and Romesh Thapar, in the 1960s were legendary—a collection of who’s who from across the world gathering for exclusive dinner parties where conversation was indistinguishable from gossip. She carries on the tradition. A typical dinner party will consist of a couple of socially savvy politicians, two top bureaucrats, a writer or two, one or two editors, a sociologist, historian and perhaps an ambassador. A guest list, as one invitee pointed out, guaranteed to loosen tongues and indulge in gossip because of the diversity of professions. The exclusivity and intimacy her evenings offer are also great for a good gossip session. Good food and liquor help to keep the conversation flowing. As a measure of her success, no A-lister has ever turned down an invitation to her at-homes. Particularly good on the First Family. Many say he has modelled his evening parties on Malavika’s salon model—the same mix of politicians, bureaucrats, diplomats and editors—fuelled by good food and wine. He has cultivated the same A-list celebrity guest list and is considered to be a fine gossip, capable of pulling everyone down in private, including his close friends. Combines business with pleasure effortlessly. The couple, both well-known gossip columnists, are sometimes described as a "gossip cartel". They know everyone and entertain regularly, their doors open to politicians high and low and friends from all walks of life. The gossip goes that there’s not a thing that goes on in the corridors of power that either one or the other of this power couple is not privy to. Arun Jaitley is a no-no area. Next Story : Psst...Heard This One? Cloyed with info on social sites? Ah well, all bits make a goulash of gossip.